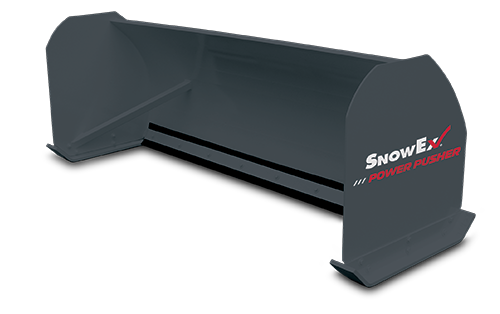 Move large volumes of snow in Hackensack with the SnowEx POWER PUSHER box plows. A universal skid-steer plate attachment system makes hook-up quick and easy so you can get your skid-steer out on the job in no time. Available in 8’ and 10’ widths, these box plows can move up to 7 to 9 cubic yards of snow. A structural steel channel across the entire blade is internally lined with stiffener ribs for enhanced structural integrity and bucket-impact strength. Side support posts provide protection against bending from hitting curbs or other accidental impact. Professional duty premium extruded rubber cutting edges are adjustable and reversible. Universal plate attachment system features fully formed gussets that support both the upper and lower posts. High-quality industrial paint to resist corrosive elements. A 36" x 36" side-plate features industry standard abrasion-resistant wear shoes designed for long service life. Blade Width 8' 0" 10' 0"
Side Plate 36" x 36" 36" x 36"